Would You Like to Take Your Brewing to the Next Level? Would you like to learn the latest brewing techniques? 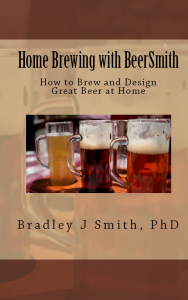 Home Brewing with BeerSmith™ is a compilation from over 70 of the best articles from the BeerSmith™ blog on detailed brewing methods, how to design beer recipes, and creating specific beer styles from around the world. This edition includes everything from how to get started with a simple batch to the latest all grain brewing methods, hop techniques, kegging, tips for making better beer, and articles focused around specific beer styles. Its a powerful compilation of brewing knowledge. The book is about the art of home brewing. An up to date resource on the latest brewing techniques. It is a compilation of my 70+ best articles from 2-1/2 years of the BeerSmith blog. It contains a variety of articles on everything from getting started with your first batch to water chemistry and adjusting the pH of your mash. It is 254 pages packed with brewing knowledge. Some of the topics include: extract brewing, partial mash brewing, hop techniques, how to design a great beer recipe, and three chapters dedicated to brewing specific beer styles. In addition I cover many newer brewing techniques not covered in other books including brew-in-a-bag, using brewing software, balancing beer with the bitterness ratio, growing hops, and much more. If you enjoy reading the BeerSmith blog, you will enjoy this as well. Most of the articles come directly from my home brewing blog, but they are organized into chapters, indexed and have been edited and printed in paperback and for the kindle so you can enjoy them anywhere. Not convinced? I’ve created a 20 page PDF file of that you can download if you sign up for our email newsletter. If you are already a newsletter subscriber, check your email for the download link. The PDF file contains chapter 3 of the book for you to enjoy for free. You can sign up using the subscribe link on the right sidebar. I would like to ask a favor -if you have read the book, take a few moments to post a review on Amazon – every positive review helps! If you would, please retweet this page on your twitter account. Its free, it will help promote the book, and also it will be fun to see how high we can drive the twitter count for this page. Just click on the “retweet this” button in the top right corner to help me out!